The Meadowdale Racetrack held its inaugural race on Sept. 14, 1958. Many racing heroes of the '50s and '60s appeared at Meadowdale. Jim Jeffords, Lance Reventlow, Rodger Ward, Curtis Turner, Fred Lorenzen, Al Unser, Bobby Unser, Roger Penske, Harry Heuer, Jim Hall, Lloyd Ruby, Augie Pabst, Jim Rathmann and Mark Donohue were just a few of the drivers that raced at Meadowdale during its heyday. 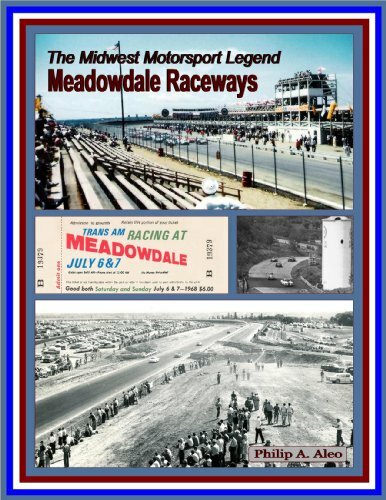 Detailing the history of Meadowdale Raceways with text, news articles and photographs, this book will preserve the history of this once famous track nestled to this day, 35 miles west of Chicago, just off of Route 31 in Carpentersville, Illinois. Includes hundreds of photos, the majority never till now available to the public, some dating from the early 1950’s before the track was even built, on up and including photos of the Raceway throughout its glorious years. The closing chapter “Then and Now” highlights and compares current photos to those taken during the 50’s and 60’s of the same locations! This “one-of-a-kind” historical photographic book on Meadowdale Raceways is definitely a keepsake that will be treasured and enjoyed by tens of thousands!